Everyone knows an energy revolution is coming—yet the most important feature of that revolution remains obscure to most people, even inside the energy industry. The social and economic organization of energy is about to change radically, a point highlighted in a recent special issue of the journal Science as Culture. For the past century, energy has largely been a monopoly business, especially in the electricity and natural gas sector, where utilities were granted monopoly control of vast territories and associated grid or pipeline infrastructures. Even in areas without strict monopolies, however, such as in the context of electricity deregulation or transportation fuels, the fact that energy is essentially a commodity business has driven energy markets toward very small numbers of very large players. As a result, energy wealth has been concentrated in a very few hands: Saudi and Kuwaiti royalty, Russian oligarchs, the oil majors, electricity utilities, mining transnationals, state energy companies, and not many others. No longer. Energy is about to change. In fact, the distribution of energy wealth is already changing. The resurgence of US oil and gas production is having huge consequences. The reason fracking technologies have generated such passionate disputes is because it has split communities down the middle, thanks to the large royalty payments it generates. Unlike offshore oil, which generates revenues only for oil companies and the federal government, shale gas plays typically generate payments of ten percent or more of the value of the energy at the wellhead to land owners. These individuals then spend much of this money into the local economy, fostering local economic growth. Communities that manage this wealth well, avoiding boom and bust cycles and carefully regulating environmental impacts, have the potential to derive tremendous long-term social and economic gains. Looking forward, the long-term growth of solar energy is likely to have similar consequences. Consider the figure below from the 2010 Technology Roadmap for Solar PV from the International Energy Agency. The figure suggests that, by 2050, solar PV technologies may be responsible for twelve percent of global electricity production. Far more interesting is the projected distribution of those resources. There is something of an assumption, especially in the United States energy sector, that the most important driver of solar energy growth will be large-scale, utility-owned solar power plants, typically located in isolated, rural or desert areas. IEA surveys of countries around the world suggest that this perception is misleading, at best. 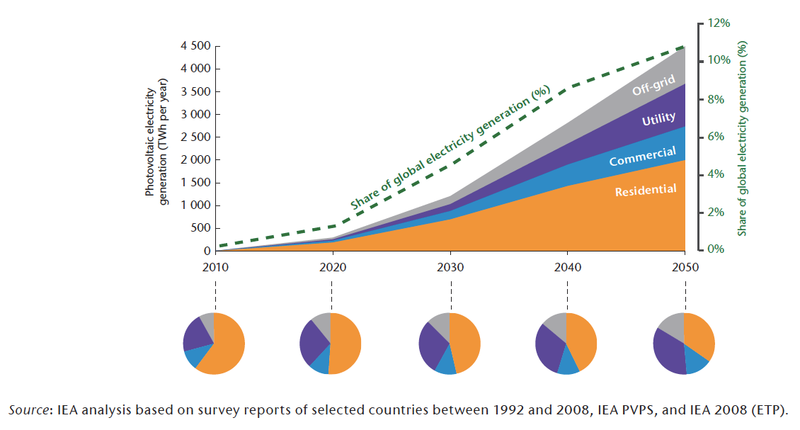 The IEA anticipates that by 2050, only one-fifth of solar energy will take the form of utility-owned solar power plants. The rest will be twenty percent off-grid, twenty percent commercial, and fully forty percent residential. If the IEA analysis is correct, this situation will have profound implications for the long-term redistribution of energy wealth. In the residential sector in Arizona and California, for example, companies like Solar City are already outcompeting utilities for customer business, leasing rooftop solar systems for significantly less than the cost of buying comparable energy from utilities. Unless utilities can develop strategies for deploying residential solar and competitive prices, solar rooftop systems will continue to bleed utility profits. And to compete, utilities will have to follow Solar City in sharing revenue with their customers, an alien concept to most utilities. As an illustration of the problem, my utility recently offered to let me buy solar-generated electricity at 13 cents per kilowatt-hour. Solar City offered to lease me a rooftop system for 5.3 cents per kilowatt-hour. Both entities were able to take advantage of solar incentives and, in all likelihood, my utility paid less per kilowatt to build their system than Solar City — a result of the cost advantage of building bigger systems. The commercial sector sees the same advantages. Big box retailers have large, flat rooftops. Parking lots and garages offer significant open space for building solar systems. Arizona State University has followed this strategy to build over 20 megawatts of solar PV systems across its four campuses. In growing economies, businesses generally can find better investments for their money than energy systems, but in slow economic times, cost-cutting by reducing facility electricity demand is often a highly effective strategy. Not surprisingly, the last five years have seen businesses spend significantly on energy efficiency and solar energy technologies. Moreover, the bulk of big box retailer energy consumption occurs during daylight hours, making them a good match for solar systems. At night, when the moon is up, the stores are closed. Just as importantly, recent research suggests that homeowners and business owners who install solar energy systems become significantly more conscious of their overall energy use. As a result, they prove more likely to invest in further strategies for reducing their energy consumption and matching the output of their solar system. As an illustration of the transformative power of new forms of socio-energy organization, a recent report from SmartPower makes fascinating reading. The work of SmartPower demonstrates that solar energy transitions can be facilitated by the power of social networks. What SmartPower has done is to deliberately build on the social capital of existing community networks to accelerate the purchase of rooftop solar energy systems, resulting in communities with rapid and impressive growth in technology adoption. While this phenomena is currently limited to the neighborhoods where SmartPower is working, it also suggests that solar may reach an earlier tipping point than most economists predict, where the density of solar adoption begins to naturally leverage social networks to result in high rate adoption. And, as solar adoption grows among home and business owners, so will the demand for the innovative new kinds of batteries and other forms of energy storage technologies that have become popular among Silicon Valley investors, further bleeding energy demand from utilities. According to a recent report from McKinsey, off-grid and isolated small grid solar is already price competitive in many rural areas and represents an important solution for many of the world’s poorest communities. While countries like India and China are rapidly building new large power plants, building large-scale grid infrastructures to poor, rural areas may prove uncompetitive vis-à-vis the solar systems that rural communities are already building. For rural, agricultural communities, biofuels may also offer an important new source of revenue. In the US, for example, agricultural producers are already profiting from revenues from the addition of ethanol to gasoline. Biofuels face an uphill struggle, especially to the extent they contribute to rising global food prices or water shortages. Bloomberg New Energy Finance nonetheless anticipates a tripling of biofuels production in the next 15 years. Their successful growth would transfer major streams of revenue away from the energy industry to a diverse array of beneficiaries in the agricultural sector. Perhaps most importantly, unlike oil, which is highly concentrated in a few nations, the potential for biofuels production—and therefore biofuels wealth—is widely distributed across the globe, as the following figure from Shell’s Oceans scenario highlights. Global wealth in the energy industry has been concentrated for a century. Today, the Global Fortune 500 list of the world’s richest companies includes 9 oil companies, 2 electric utilities, 2 automobile companies, and 1 mining conglomerate, for a total of 70% of the top 20 companies by revenue. Among countries, energy wealth and power are concentrated in the hands of just a few states, most of whom use that wealth to prop up authoritarian forms of government or to finance terrorism. The coming energy revolution is essential to solving the Earth’s global environmental crisis. But its ultimate value arguably lies even deeper, in a global redistribution of wealth and power, not just into new hands but downward, into the hands of the multitude. Of course, the powerful find this idea just a tiny bit inconvenient and can be expected to fight back, tooth and nail. Already, utilities in the United States aim to undermine the new energy transition, joining the powerful forces of the oil, gas, and coal lobby. Humanity’s challenge is thus clear: build an energy future in which the financial benefits of energy production are widely distributed across and within societies, breaking the back of the energy monopolies. The technologies exist. Now we must organize them in the right ways.